I'm not much for reviewing food but once in a while the urge strikes. It struck a couple days ago when I saw an ad on TV for Dars chocolate, some of the tastiest stuff in Tokyo. 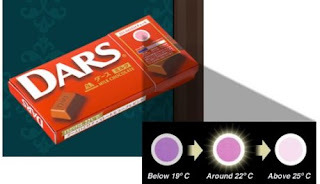 I've been hip to Dars for several years now, but as a re-marketing ploy they have released the little trays of chocolates with a temperature indicator on the front, which recommends that the chocolate be eaten at around 22 degrees, or when the heat-sensitive circle turns pink. I think the website says it best: "Mouth-melting is 22 degrees C". So after seeing the commercial I just had to go out and buy myself a tray (I would say bar but well, in the spirit of being accurate I shall use tray). In the konbini the circle was slightly dark, indicating it wasn't yet at optimal temperature. Once I got outside though and watched it expectantly (kind of like a home pregnancy test! ), it turned a rosy shade of pink and after confirming that the shade matched the colour key indicating 22 degrees, I ripped that sucker open and mouth-melting delight!! I suppose that before this temperature sticker we could have surmised that the chocolate was too hard after trying a piece, but now we can increase the efficiency of our consumption by only eating the chocolate once it has reached 22 degrees. I'll say it again, mouth-melting delight!!! I actually noticed that about a week or so ago when I bought a pack/tray of the white chocolate before heading to class. It piqued my interest as well, glad to see someone else justify my curiosity hah.